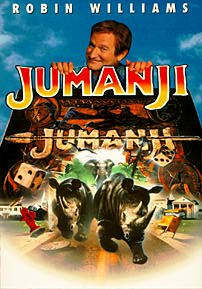 CelebritySpice.com - JUMANJI with Robin Williams, Kirsten Dunst, Bradley Pierce, David Alan Grier, Bonnie Hunt & Jonathan Hunt. A strange board game plays havoc with the lives of those who play it. Director Joe Johnston's "Jumanji" is a wild, "Twilight Zone" type movie.